Music plays an integral role in the liturgical celebrations at St. Mary’s Basilica. The Music Ministry is led by our Organist and Director of Music, Gordon Stevenson, and includes many people who participate as choir members, cantors and instrumentalists. As directed in the Church’s ‘Constitution on the Sacred Liturgy’ (Sacrosanctum Concilium, 1963), the assembly are called to “full conscious and active participation” in the Liturgy. 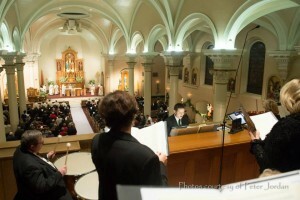 Article 116 of the same document states: “The Church acknowledges Gregorian chant as specially suited to the Roman liturgy: therefore, other things being equal, it should be given pride of place in liturgical services.” In accordance with this direction, many of our Solemn Liturgies are chanted and the entire assembly is encouraged to participate wholeheartedly in the parts of the mass which are proper to them, i.e. the Ordinary and the Dialogues between the celebrant and the congregation. The choir are a diverse group of people, with varying degrees of experience in formal musical training and a variety of cultural backgrounds, but who are united wholeheartedly in their love for the liturgy. Reflecting the demographics of Phoenix and our integrated liturgies, our choir sing regularly in English, Spanish and Latin. Musical genres range from the contemporary music of Rutter, Chilcott and Lauridsen to the traditional choral classics of Bach, Mozart, Durufle and Palestrina. The full choir are present for the 9:00 AM Mass on Sundays throughout the year, with the Saturday 5.00 PM and Sunday 11.00 AM Masses being led by a smaller ensemble of singers from the choir. All the weekend liturgies follow the same musical program and the grand pipe organ is featured prominently throughout the services in providing accompaniment, improvisation and sacred repertoire. The choir also perform concerts each year, usually during the Easter and Christmas seasons. Regular rehearsals are held on Thursday evenings from 7:00 to 9:00 PM from August through June. Instrumentalists are always required during the seasons of Christmas and Easter. At St. Mary’s, we are fortunate to have exceptional resident professional instrumentalists enhance our worship on these solemn occasions in the persons of Daga Suchon, violinist, Bruce Pulk, timpanist and Josh Whitehouse, trumpeter. If you play a musical instrument proficiently and would like to share your skills and talents please consider contacting the Director of Music.